blog.sweetlovetruly: SDD Clutter Free Day 9: I've become a book-decluttering machine! 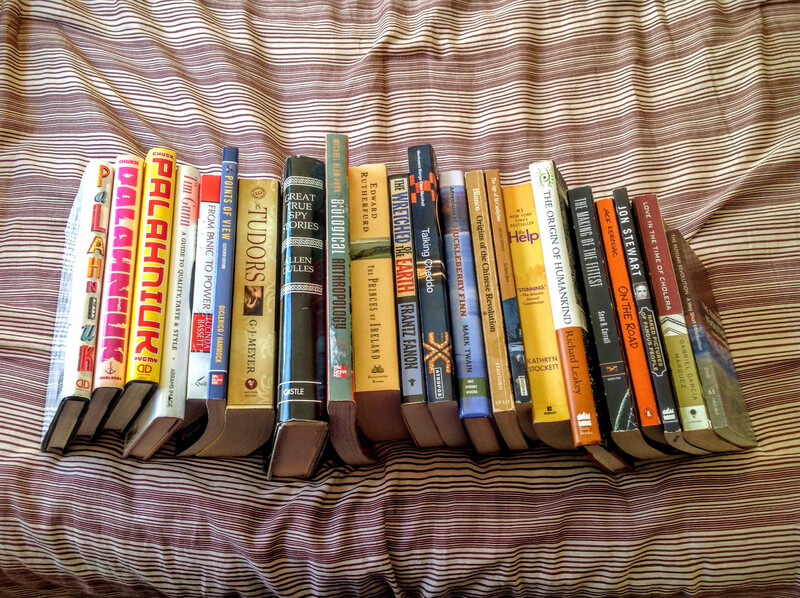 SDD Clutter Free Day 9: I've become a book-decluttering machine! It's Day 9 of the So Damn Domestic Clutter Free Countdown and time to declutter 22 items. At the end of the day, I will have decluttered 232 items, which is half of the total number of items I'll be decluttering this month! I have become a ruthless, book-decluttering machine! Today, I had no anxiety whatsoever as a yanked books from the shelves. This one, gone! This one, GONE! Where were all these books yesterday? Yesterday, when it took me multiple hours to shakily decide on 23 books? Yesterday, when I put five books back on the shelf and replaced them with unplayed board games to get to my total? Yesterday passed and the questions simplified. -Am I really interested in it, or do I feel obligated to keep it? -Did I start this book and stop reading because I didn't enjoy it? -Is it a history or hobby book that I can get easily find a plethora of resources for, should I choose to explore this topic? -Is it so mainstream that I'll never have to wonder if the library will carry a copy? Those were the main trains of thought that created today's pile. 1, 2. Tell-All and Snuff by Chuck Palahniuk. Got part way through and had no interest in continuing, but felt obligated because I love some of his other books so much. First picture of this challenge that doesn't have a cat in it! It was 100 degrees today so they were spread out on the cool floor. 3. Pygmy by Chuck Palahniuk. Finished it, but didn't connect with it. 4. A Guide to Quality, Taste, & Style by Tim Gunn. I love Tim Gunn, but my interest in fashion does not last the length of time it takes to read a book. 5. From Panic to Power by Lucinda Bassett. Too self-helpy for me. You know I love me some self-development, but this style of writing feels like it's trying to justify itself. Not my thing. 6. Points of View: Eleventh Edition edited by Robert E. Diclerico and Allan S. Hammock. I remember thinking it was a well done politcal book when I took an American Government class. That was in 2008, so if I haven't touched the book since then, I probably never will. 7. The Tudors by G.J. Meyer. This was a decent read. Now I can return it to my grandpa. 8. Great True Spy Stories edited by Allen Dulles. I looked it over and realized, "Wow, I have zero interest in this." Why was I keeping it? Who knows. 9. Biological Anthropology: Sixth Edition by Michael Alan Park. Decent textbook. Probably not going to read it out of school. 10. The Princes of Ireland by Edward Rutherfurd. I bought this at Goodwill because I thought it was non-fiction, but it's fiction. It's an Epic Saga. I don't know. I might like it, but it'd be low on my priority list and sit on the shelf forever. I'd rather find it again when I'm truly interested than make it wait around for me. 11. The Wretched of the Earth by Frantz Fanon. Eye-opening anti-colonialist political theory. Not an easy read so I probably won't do it twice, but it is powerful. 12. Talking Cheddo by Menkowra Manga Clem Marshall. So, one quarter, I had a teacher assign a preposterous amount of reading. This book was supposed to be a side project on the discussion board. The discussion board stayed empty because literally only one person in the class could manage so much reading, and this book is super dense. It got left behind. Looking at in now, it looks like important work. Maybe I'll track it down again someday. 13. Adventures of Huckleberry Finn by Mark Twain. I won't have trouble finding a copy if I desire one. 14. Origins of the Chinese Revolution by Lucien Bianco. I love studying revolutions and the class I read this for was one of my favorites, but I don't need to hold on to this. 15. The Age of McCarthyism by Ellen Schrecker. Another one of my favorite topics to study. Again, don't need to keep the book. 16. The Help by Kathryn Stockett. Good story. Glad I read it. Will be easy to find if I want to read it again. 17. The Origin of Humankind by Richard Leakey. I can give this back to Grandpa. 18. The Making of the Fittest by Sean B. Carroll. This was very readable. Time to go back to Grandpa. 19. On the Road by Jack Kerouac. Amazing, on a sentence level. Otherwise, pfft. 20. Naked Pictures of Famous People by Jon Stewart. There's some funny stories in there, but I don't revisit them. 21. Love in the Time of Cholera by Gabriel Garcia Marquez. Okay, so, you see some pretty girl and obsess over her for decades? What if she's terrible or incompatible with you? Like, get over it, man. 22. The Russian Revolution: A Very Short Introduction by S.A. Smith. Even my history teacher admitted there aren't a lot of great resources on the Russian Revolution and this was settling. It's a nice little summary, though. You can see I had a much easier time justifying why I'm getting rid of books today. I didn't even try yesterday because...well, I had things to do, for one. It had taken me so long to come up with the declutter pile, I didn't have time to list out every reason. Also, there was a block there. I wasn't authentically choosing items. When I look at yesterday's pile today, though, I'm happy with it. It worked out fine. I'm so glad I pushed myself to reflect on my attachment and work through it. I've yet to find a time when confronting uncomfortable feelings had a negative outcome. A Note on My Ruthlessness: I easily could find good things to say about any of the books on this list. Those good things are not why I'm getting rid of them though. I wrote my primary reflections on each book, not full, even reviews. Affiliate links: all links go to Amazon so you can see other reviews or descriptions and buy or don't buy whatever you want so I get moneys.